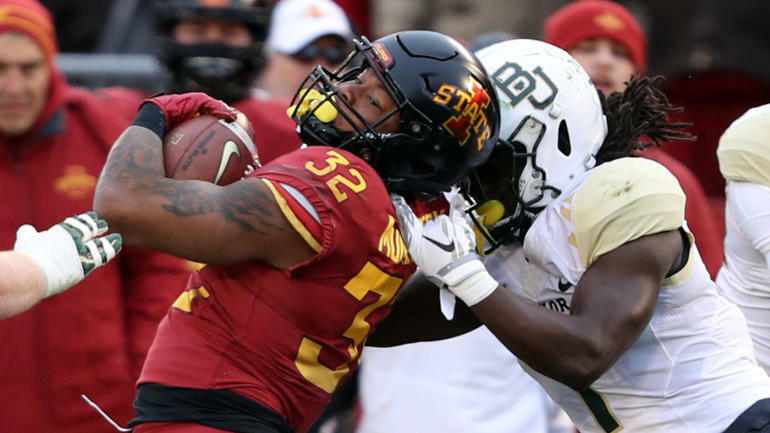 22 Iowa State is hosting Baylor Saturday afternoon, and things got heated between the Cyclones and Bears. Players rushed over to break things up including Montgomery and Bears defensive lineman Greg Roberts . Montgomery pulled Roberts off the pile and away from the action, and that didn't seem to sit well with the 6-foot-5, 264-pounder. The incident came one play after Baylor safety Chris Miller was assessed a 15-yard penalty for a late hit out of bounds on Montgomery. On that play, Stewart didn't let up when the two ran out of bounds and pushed Montgomery into the Gatorade cart.